(i) How many bulbs were sold Friday? 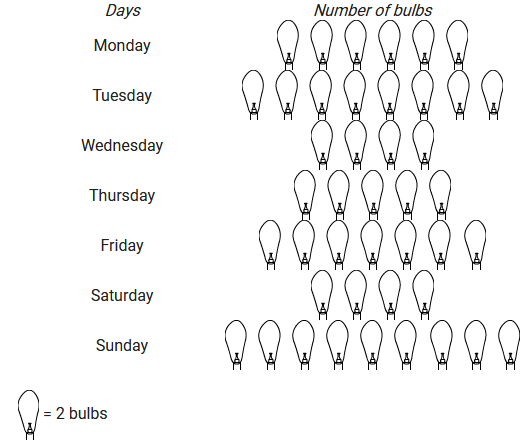 (ii) On which day maximum numbers of bulbs were sold? (iii) If one bulb were sold at the rate of Rs 10, what was the total earning on Sunday? (iv) Can you find out the total earning of the week? (v) If one big carton can hold 9 bulbs. How many cartons were needed in the given week, more than 7, more than 8 or more than 9? Therefore, On Sunday, maximum bulbs were sold. Therefore, Total earning of the week = Rs 10 x 86 = Rs 860. Given that one big carton can hold 9 bulbs. So, more than 9 cartons are needed. (ii) How many students are using cycle or walking as a mode of travel? (iii) Which is the most popular mode of travel? 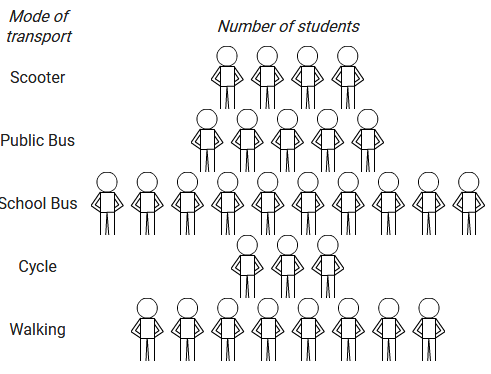 (ii) The pictograph shows that the maximum number of students, i.e. 10 are using the school bus as a mode of traveling to school. Therefore, the most popular mode of travel to school is the school bus. (i) Which class has the maximum number of girl students? (ii) is the number of girls in class VI is less than the number of girls in class V? 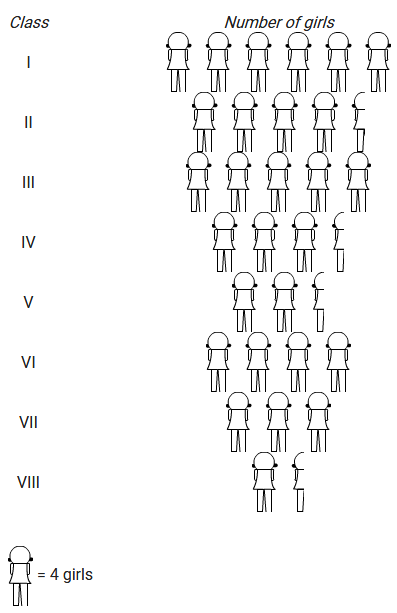 (iii) How many girls are there in VII class? Based on the above pictograph, we can prepare the following chart to determine the number of girl students in each class. Therefore, Class I has the maximum number of girls. Observe the above pictograph and answer the following questions. 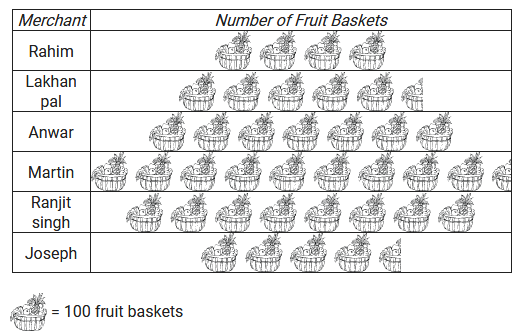 (i) Which merchant sold the maximum number of baskets? (ii) How many fruit baskets were sold by Anwar? (iii) The merchants who have sold 600 or more number of baskets are planning to buy a godown for the next season. Can you name them? (i) On the above chart we can see that martin sold the maximum number of baskets i.e. 950 fruits baskets. (iii) On the above chart we can see that Anwar sold 700 fruit baskets, Martin sold 950 fruit baskets and Ranjit Singh sold 800 fruit baskets. Therefore, Anwar, Martin and Ranjit Singh are the merchants who are planning to buy a godown for the next season. The pictograph shows different subject books which are kept in a library. (i) How many English books are there in the library? (ii) How many maths books are there? 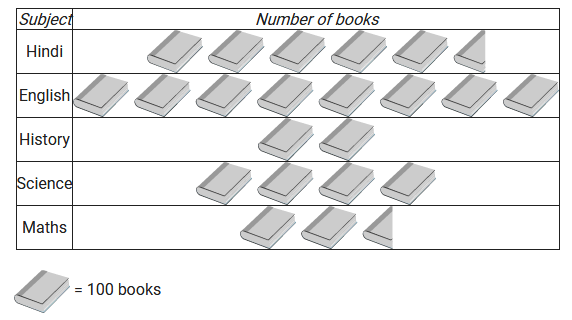 (iii) Which books are maximum in number? (iv) Which books are minimum in number? (i) From the above charts, we can say that there are 800 English books in the library. (ii) The calculation on the above chart shows that there are 250 Math books in the library. (iii) From the above charts, we can say that the English books are maximum in number, as there are 800 books on that subject.